The Kindle Fire is Amazon’s new tablet, taking advantage of what they have learned from the Kindle, in order to deliver a portable device which lets users consume even more media on the move. So firstly what is the Kindle Fire? 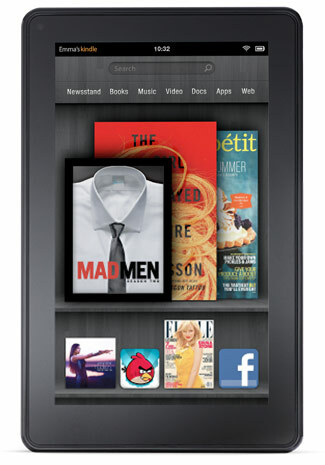 The Kindle Fire houses a 7 Inch IPS colour display, protected by Gorilla Glass (a scratchproof re-inforced material). Amazon have opted for a highly customised version of Google Android, coupled with a dual core processor and 8 GB of flash storage. What can you do with a Kindle Fire? The Kindle Fire features everything you would expect from a tablet, but with much deeper integration with Amazon’s own services for a one click experience. For example, they have integrated their magazine subscription service where you can choose from hundreds of titles, such as Bon Appetit, Elle, and Oprah. Special editions of titles like Vanity Fair, Wired, and GQ come with built-in video, audio and other interactive features. You also get access to Amazon’s growing catalog of 100,000 movies to stream or purchase directly through your Amazon Fire tablet (requires an amazon prime subscription) as well as over 17 million mp3 tracks available to buy from their music store. Plus you can browse the web, access email and have access to 1000’s of apps through the Amazon android app store. How does this compare to an ebook reader? When it comes to reading books, nothing beats a dedicated e-ink ebook reader. Tablets such as the Kindle Fire are great for consuming multimedia, and for short tasks, but reading an actual book for anything longer than 30 minutes from a colour tablet is painful. E-Ink ebook readers on the other hand provide an experience which is as close to ink on paper as possible, and makes for a lot less eye straining when reading for extended periods. How does the Kindle Fire compare to the Apple Ipad? The apple Ipad with it’s 9.7″ screen is a fantastic device, but starting at over $450 / £399 it is a premium product that not many can afford. The Amazon Fire is a 7″ tablet, which retails at only $199, which makes it not only highly affordable, but a no brainer if you have not bought a tablet yet, but want to be able to entertain yourself on trips or at home. If you are looking for an ebook reader, then we recommend going for an Amazon Kindle which is currently the leader when it comes to ebook readers. Their devices are affordable, light, and have great compatibility across many different formats. Plus with a Kindle ebook reader you won’t get sore eyes after reading for extended periods of time. If you are looking for a budget tablet to watch movies, tv shows, check email, browse the web, and haven’t bought an Apple Ipad yet, then the Kindle Fire could provide good value. If you are looking for the best tablet out there, I would say that there is only one king in town, and that is the Apple Ipad 2. Yes it’s more expensive, but with the largest app store in the world, some of the most powerful hardware, and a sleek Apple-eske design, you just can’t fault it. I recommend checking it out on Amazon for the best prices on tablets here. When and Where Can you Buy The Kindle Fire? The Kindle Fire was announced today (28/09/11) and is due to be released on the 15th of November in the USA only. If you are from the US you can pre-order your device here. For UK users, It looks like Amazon won’t be shipping here at least until next year. I would therefore recommend the Ipad 2 which you can get right now.